The Endless Summer Gas Outdoor Firebowl is an awesome blend of sophistication, outdoor charm and usability. The durable 41.25″ slate table top provides ample room for plates, glasses and more. If you’re in the market for one of the best fire pit tables the Endless summer GAD860SP might be just what your looking for. Lets go ahead and run through an overview of the pros and cons of this unit before diving in. Upon receiving this propane fire pit we were faced with a massive 150 lb. box full of hardware and metal. It took two of us to get the box over to the back patio where we proceeded to see what we had gotten ourselves into. 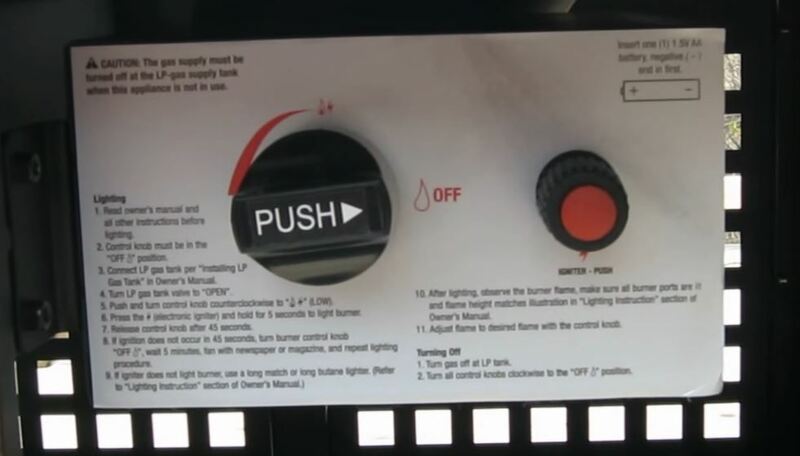 One of our main gripes about this unit is how unclear the instructions are, it might as well have been written in a foreign language. It took us a full two hours of constant work to get this gas fire pit assembled from start to finish, but boy was it worth the effort. 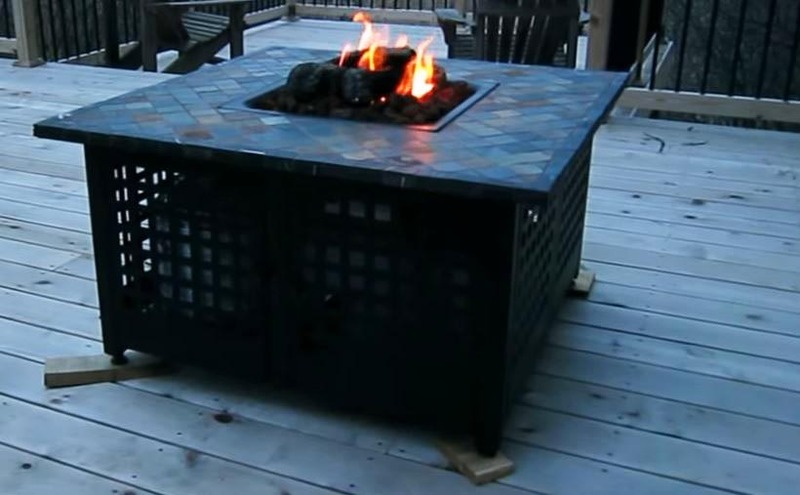 For clarity, we have provided a video in the bottom of this post detailing the necessary assembly steps for the Endless Summer Outdoor Firebowl. Once assembly was complete we were left with an incredible looking propane fire pit. The slate top is covered in rustic blues, greens and browns that fit perfect in any outdoor environment. The stone also has the added advantage of being extremely durable and can withstand the elements, heat from the fire pit and really anything you can throw at it. It has an very wide 10″ ledge circling around the center fire bowl which provides more than enough room for full sized dinner plates, glasses of wine and all your various snack plates. Most importantly however, it just looks and feel very expensive so you can easily one-up your neighbors in your backyard battles. Installation of the propane tank was very easy with the slid out tank tray. All we had to do was open the grated doors, pop the tank in, hook up the gas connection and close it back up. Speaking of the grated doors, we think that the grating is a bit too coarse and lets you see to much into the interior below the fire pit. We would have preferred a finer mesh so that the internals would have been much harder to spot. It seem that Endless Summer has also thought of this as they provided a handy black propane tank cover to use. We were able to slip the cover over our 20 lb. propane tank which effectively hid it in plain site. The cover was certainly a welcome addition and something we weren’t expecting. Going back to the size of this gas fire pit, it is quite large, we’re talking 150 lbs. plus, once you have a full propane tank installed. This is both a good thing and a bad thing. For one, we are not worried in the least that it’ll blow over in a storm, unless an f4 tornado comes through our back fence. But on the flip side it is very hard to move with only one person. Even with two people it requires a bit of waddling to get it into place, so be sure to built it very close to where you want it to end up. Once all set up the Endless Summer GAD860SP has adjustable feet on all corners making it very easy to level the fire pit if your uneven ground or a deck. There is also more than enough extra space underneath the table top to store a few extra odds and ends in addition to the propane tank. Once we had the propane tank installed we spread the included red lava rock and fake logs on top which really help to put the finishing touches on the fire pit. It looked incredible once we had everything in place. One thing to keep in mind however is that you cannot use fire glass with this unit. Unfortunately the airflow is too restricted and the flame dies out. If your really set on doing so however, you can swap out the fire bowl for a stainless steel version with added air holes to make it work. For our tests however, we just decided to leave the lava rocks and logs in place. With the lava rocks and logs in place and the propane tank connected it was time to fire it up for the first time. Unlike the BCP Extruded Aluminum Gas Outdoor Fire Pit Table, the flame adjuster and electric ignition were very easy to reach as they were located as close the to door as possible while still being out of sight. A few seconds of holding down the igniter with the gas on did the trick and we were soon enjoying a nice bright orange flame. As the lava rocks began to heat up they produced a soft red glow that really drove up the luxury feel of this fire pit. We decided to invite all our neighbors over to see our latest toy and were pleasantly surprised to find that we could fit eight of us around the table comfortably on patio chairs and if needed, I’m betting we could have fit a couple more. At this point we could tell the unit was pumping out some serious heat and as the temperature outside fell the area around the fire pit was still nice and cozy. 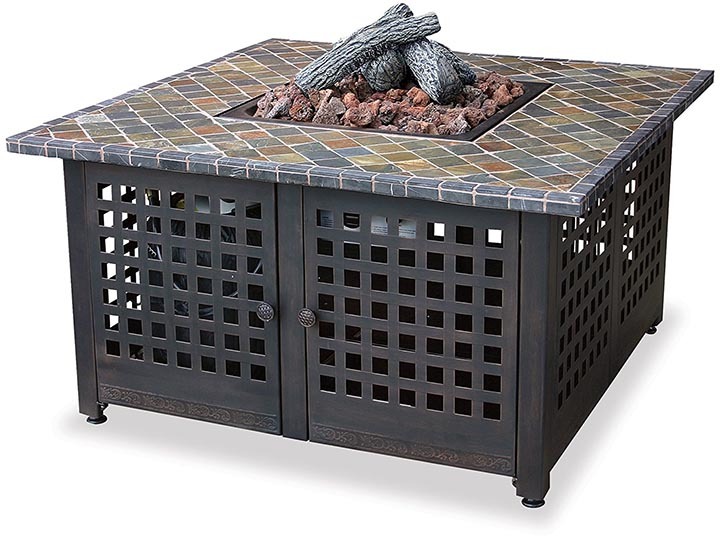 We got a ton of compliments on the overall design of the fire pit from the upscale slate table top to the stamped metal scroll work near the base of the unit. As the night progressed we did notice a bit of soot buildup on the logs and lava rocks, this is usually due to a wrong fuel to oxygen ratio and we’ll have to adjust the position of the logs and rocks to get it just right. After the night had ended we let the Endless Summer fire pit cool off a bit before using the included cover to shield it from the elements. 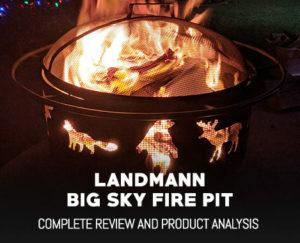 As with a few other fire pits we have reviewed the cover was a fairly poor quality product. We would recommend instead that you grab something like the Smart Living 44-Inch Fire Pit Cover as it is has far superior water, sun and heat resistance than the included cover. 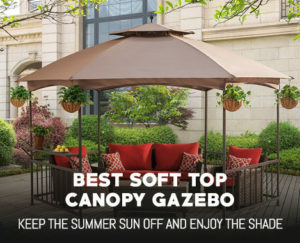 Getting a better cover will go a long way to preserving the look of your new Endless Summer gas fire pit. 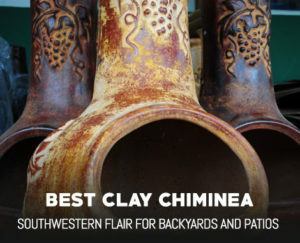 Overall this would make in incredible statement on any patio or deck as it is a high quality product with stunning looks. We love the rustic slate table top, slide out tank tray and the heavy duty construction of the unit. While the assembly took far longer than it should have, a one time ordeal to have a lifetime of great summer (or winter) nights was definitely worth the effort. This unit feels like it should cost two or three times more than what we paid for it and certainly performs that way too. If you looking for a great family friendly propane fire pit or something to just one-up your neighbors outdoor man cave the Endless Summer Gas Outdoor Firebowl will assure your victory. In summary this propane fire pit is worth every penny and would be an excellent addition to your backyard.